AllegroMedical.com presents The Sa-Wan Herbal Ball Starter Kit 10 Facial Treatment. The Sa-Wan Herbal Ball is a traditional hot therapeutic treatment that can be pressed along the Sen Sib lines, acupressure zones, and more to increase blood flow and lymphatic drainage. The Sa-Wan Ball can be used in combination with traditional Thai or Swedish massage or as a tool to work on specific parts of the body that need special attention for muscular tightness or pain. Take care when lifting the steamer lid to release the steam away from the body. The temperature of the Sa-Wan Ball is very hot when first taken out of the steamer and cools over time. Ball handle can be very hot when lifting from the steamer; use washcloth or similar item to grab handle when necessary. Always test the temperature of the ball before applying to the client, whenever a new ball is retrieved from the steamer, and also during its use to feel the evolution of the heat of the ball. 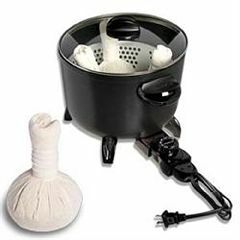 The temperature that the client experiences from the herbal ball, is related to the temperature of the ball, the time that it is touching a single point on the body, and the pressure with which it is applied . The ball is often very hot when retrieved from the steamer. A way to utilize this heat effectivly is to 'stamp' with rapid movements along the body, gradually working more slowly and detailed, as the ball begins to lose some of its heat. There are five basic techniques in using the Sa-Wan ball, with the most popular being Rocking and Rolling. In all cases, the ball is applied using steady pressure, perpendicular to the area being treated. Rolling - pivoting the ball in a circular motion while continuing to maintain steady, downward pressure.